If you could donate a percentage of every online purchase you make to ACCESS to support education projects, would you do it? We hope so! We-Care.com lets you do this, with more than 900 online merchants. Just click through the access.we-care.com marketplace and shop on your favourite online stores as you normally would, and a percentage will be automatically donated to ACCESS. Not sure when or where you would use this? Participating merchants include retail, travel, financial services, and quite a bit more. Book your flight and hotel. Rent a car. Shop for books. Apply for a mortgage. Buy furniture and household items. Send gifts. Search for apartments. Pick out a cell phone plan. Order web hosting and office supplies. Subscribe to magazines, newspapers, DVD services, and even satellite TV. Planning on buying a book from Chapters or Indigo? Next time you are, you can support ACCESS online! You can also install the We-Care.com plug-in for Internet Explorer or Firefox. With a plug-in, your donations will count (even if you forget to visit We-Care.com). ACCESS benefits from all of your purchases through access.we-care.com - the program costs nothing for ACCESS, and there's no extra charge for you. Not only can you give, you also have access to special offers and discounts. 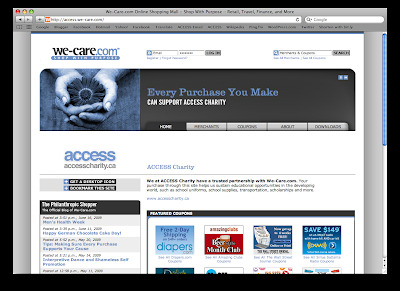 Enjoy being an occasional shopper or even a "shopaholic" while using access.we-care.com to extend your dollar from just your favourite book or pair of shoes to the comfort of knowing that you helped a worthy cause, ACCESS!